On that day my son Bobby and me were walking at the fair, and everything was fine till he saw that pirates' pavilion. Hey, mom! I wanna see what's there! Wow! It's a real treasure chest! Bobby, don't touch anything here! Mooom! Bobby! Bobby! I'm coming! What's this? A coast, a sailing ship? and where's Bobby? 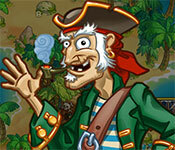 This game has a free trial version, click to start Match Three Pirates! Heir to Davy Jones Free Download. If you like it, please buy the full version to support the developer, thanks.